Prior to 2016, there would have been no reason to think that both parties could compete for GA-6. Since being elected in 2004, Price has never won less than 60% in a general election, and Republican presidential candidates routinely won by lopsided margins there — John McCain carried the district by 19 points in 2008, and Mitt Romney followed that up with a 23-point victory in 2012. But Donald Trump only carried it by a point and a half — 48.3% to 46.8% — in November. Of all 241 Republican-held districts, Hillary Clinton improved on Barack Obama’s 2012 performance more in GA-6 than she did in any other except for TX-7, held by Rep. John Culberson (R). Big swings in the presidential results in congressional districts were common across the country. According to figures compiled by Daily Kos Elections, a left-leaning website that produces outstanding nonpartisan information on down-ballot races, close to half of the nation’s House seats (200 of the 435) saw at least a five-percentage point change from 2012 to 2016 in Democratic or Republican presidential performance (or both). The first are ones like GA-6, the seat that Tom Price is likely to vacate soon. 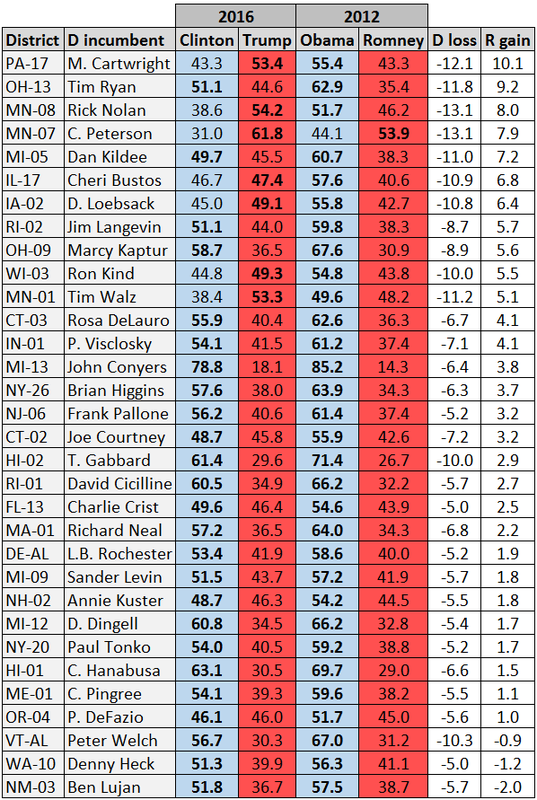 These are seats with Republican incumbents where Hillary Clinton performed at least five percentage points better than Obama in 2012, Donald Trump underperformed Mitt Romney’s 2012 share by at five points, or both. In other words, these are Republican-held seats that became significantly more Democratic at the presidential level in 2016. The second group includes seats where the opposite happened: These are seats held by Democrats that got significantly more Republican in 2016. In all of these seats, Clinton performed at least five points worse than Obama, Trump performed at least five points better than Romney, or both. While these seats saw big changes at the presidential level, that doesn’t necessarily mean they will be competitive in 2018. Many of these seats are simply very blue seats that got a little less blue or very red ones that got a little less red. And some of the districts that would appear to be the best targets for takeover by the other party feature strong incumbents who have considerable crossover appeal. But it’s also possible that some of these seats will be competitive in 2018 and that the big changes in the presidential results in them represent a warning to the incumbent party that the ground underneath their feet is moving away from them. From the presidency through lower-ballot races, Republicans rely on a preponderantly white coalition that is strongest among whites without a college degree and those living outside of major metropolitan areas. Democrats depend on a heavily urbanized (and often post-industrial) upstairs-downstairs coalition of minorities, many of them clustered in lower-income inner-city districts. They also rely on more affluent college-educated whites both in cities and inner suburbs. Specifically, they found that Democrats control 87 of 108 districts that have higher-than-average percentages of white college graduates and racial minorities, while Republicans control 152 of 176 districts that have lower-than-average percentages of white college graduates and minorities. And as shown in Tables 1 and 2, the Republican-held districts where Clinton improved the most on Obama’s margin tended to have higher percentages of minorities and college graduates, while the Democratic-held ones where Trump improved the most on Romney’s tended to have lower percentages of those groups. With that, let’s start with this first group: the Republican-held seats that moved the most toward the Democrats in 2016. These 37 seats are mostly located in suburban areas that either have higher percentages of residents over 25 with at least a four-year college degree than the national average (which is about 30%), or are more diverse than the nation as a whole (the nation is a little over 60% non-Hispanic white) or both. The only exceptions are ID-2, UT-1, and UT-4, which Trump won comfortably but by far smaller margins than Mitt Romney did in 2012. This was mostly due to Trump bleeding votes to third-party candidates, particularly conservative Evan McMullin, who is Mormon (Utah is the most Mormon state in the country by far, and Idaho is second). That also helps explain Trump’s massive loss of vote share from Mitt Romney’s 2012 showing in all four Utah congressional districts: Trump still won the state handily, but his percentage of the vote dropped by at least 20 points in all four districts, by far his biggest fall-off from Romney of any districts in the country. Clinton, meanwhile, only improved marginally on Obama in the Utah districts. This makes sense, as these Republican districts went from arguably their ideal version of a GOP presidential candidate (Romney, who was Mormon himself) to their worst possible GOP candidate (the non-Mormon, rough-around-the-edges Trump). But, again, Trump still won all these districts, and the only one of these that might be a Democratic target is UT-4, where Rep. Mia Love (R) won reelection by 12.5 points, improving on her 2014 showing when she won her first election. Nearly half of these seats (16 of 37) are from California or Texas in Republican suburban enclaves. Trump still won some of them comfortably, like Rep. Duncan Hunter’s (R) CA-50 or Rep. Sam Johnson’s (R) TX-3. Johnson is retiring, but there’s little reason to think a district that voted for Trump by about 14 points is truly vulnerable to a Democratic challenge. 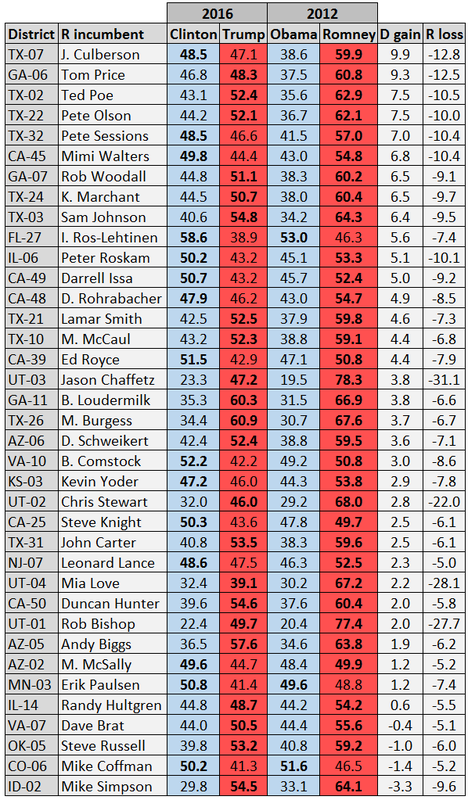 Democrats did heavily compete for several of the districts on this list, but some of those incumbents they targeted — such as Reps. Darrell Issa (R, CA-49), Steve Knight (R, CA-25), Mike Coffman (R, CO-6), Kevin Yoder (R, KS-3), and Barbara Comstock (R, VA-10) — all won reelection and ran several points ahead of Trump in their districts. Democrats are hoping that Trump will drag down these incumbents in a midterm year, when the president’s party historically does poorly, but it’s far too soon to know what Trump’s standing and the strength of the Democratic challengers will be. For years, Rep. Tim Ryan (D, OH-13) has been the candidate of the Democrats’ future in Ohio — and perhaps he always will be. The long-serving (first elected in 2002) but still young (he’s just 43) congressman has long been mentioned as a potential statewide candidate in Ohio, but so far he’s always taken a pass. But Ryan appears to be considering a gubernatorial run in 2018; if anything, he’s raised his profile in recent months by unsuccessfully challenging House Minority Leader Nancy Pelosi for the leadership of the Democratic caucus (about a third of the caucus supported him — not bad for a longshot challenge). He also might decide to go statewide because his safe Democratic district, which stretches from Youngstown to Akron, is suddenly not quite as safe as it used to be. While Hillary Clinton still won OH-13, her 6.5-point margin was more than 20 points weaker that Barack Obama’s 27.5-point edge just four years prior. Ryan still won easily, as he always does, but if the major shifts we saw across the white, blue collar small cities and rural areas of the Frost Belt — an area stretching from Minnesota to western New York that one could rename the “Trump Belt” based on the past election results — persist and bleed down the ballot, Democratic House members like Ryan could increasingly be an endangered species. Of the 32 House districts held by Democrats where Clinton either declined by five points or more from Obama 2012, or where Trump did at least five points better than Mitt Romney 2012, Obama carried all but one of them in 2012. The exception was Rep. Collin Peterson’s (D) MN-7, which was and still is the most Republican district held by any Democrat. However, MN-7 went from a district Romney won by about 10 points to one Trump carried by more than 30. All told, Trump flipped several of these districts, with the biggest change coming in Rep. Matt Cartwright’s (D) PA-17: Obama’s 12-point win turned into a sizable 10-point victory for Trump. Two other Minnesota districts with Democratic incumbents, MN-8 (Rick Nolan) and MN-1 (Tim Walz), also swung heavily to Trump, and both Nolan and Walz only barely won reelection. In Nolan’s case, that wasn’t a shock — both parties heavily targeted his seat — but Walz’s close call was surprising. Nolan and Walz are both reportedly considering entering the already-crowded Democratic primary for governor. If either of them jump, or if Peterson retires after flirting with the idea the past few cycles, their districts very well could be relatively easy pickups for the Republicans. Rep. Cheri Bustos (D, IL-17) is also a possible gubernatorial candidate, and her district would be another tantalizing option for Republicans if it was open. Former Rep. Bobby Schilling (R) used to hold the seat, but Bustos, with an assist from redistricting, beat him in both 2012 and 2014. But when Illinois Democrats drew the seat at the start of the decade, they probably didn’t think a GOP presidential candidate would be able to win it in 2016, but that’s exactly what happened, even though Bustos won reelection easily. Redistricting is not always foolproof. A court-ordered remap of Florida, conducted in advance of last year’s election, made the Tampa Bay-area FL-13 seem significantly more Democratic. Obama won the district 55%-44%, whereas he had only won it by a point under the old map. After the new maps came out, incumbent David Jolly (R), who had won a much-watched special election in early 2014, decided to run for Senate. Jolly later returned to the House race after Sen. Marco Rubio (R) made a last-second decision to run for reelection, but party-switching former Gov. Charlie Crist (D) seemed like a clear favorite, and Republican outside groups (who had a preexisting poor relationship with Jolly for many reasons) largely left Jolly to fend for himself. Crist ended up winning, but only by about four points, similar to Clinton’s underwhelming three-point win in the district. In other words, the district was not as Democratic as it seemed, and Jolly is considering a rematch with Crist. One other district that really stands out on this list is Rep. Ron Kind’s (D) WI-3. Kind was unopposed last year even though his southwest Wisconsin district moved from Obama to Trump, similarly to the other “Trump Belt” districts mentioned above. He is another incumbent who could face a real challenge next year after coasting the past few cycles. Overall, demographics help explain why these districts moved toward Trump in 2016: All but two of the districts on this list either have lower-than-average minority populations or lower-than-average numbers of college graduates — the exceptions were HI-1 (Colleen Hanabusa) and NJ-6 (Frank Pallone). The absence of favorite son Barack Obama from the Democratic ticket probably explains Clinton’s big drop-offs in both Hawaii districts (she still easily won both districts and the state as a whole). Trump’s improvement on Romney in Pallone’s affluent, diverse, and highly-educated district is a little harder to explain — Democratic performance there might have been overinflated in 2012 because some of the district’s Republican areas were hit hard by Hurricane Sandy just prior to that election — although Clinton’s overall 16-point win doesn’t indicate the district really is in play. Another fluky “district” on this list is Vermont’s statewide at-large seat, held by Rep. Peter Welch (D). Clinton ran 10 points behind Obama in lily white and highly-educated Vermont, but Trump also did slightly worse than Romney — the rest of the votes went to third-party candidates, including home-state Sen. Bernie Sanders, who won 6% of the state’s votes as a write-in. Ultimately, Republicans might pick a handful of these districts to run well-funded challenges in 2018, particularly the ones in the Trump Belt that the president carried last year. If they could pick off one or more of them — and if any of the incumbents retire from a Trump-won district, that becomes a very real possibility — it would insulate them from potential losses elsewhere. Just because the presidential results swung so wildly in so many congressional districts does not necessarily mean that the incumbents in those seats will truly be vulnerable in 2018 or beyond. Incumbency is still quite helpful in winning elections, and the 2016 election — which featured two unpopular presidential candidates and a Republican, in President Trump, who was massively different, at least in terms of style, from previous GOP nominees — might be something of an outlier that doesn’t truly translate down the ballot. But as the two parties sort out their targets for 2018, they’ll be intently studying many of the districts on the two lists above, and also the districts where their party’s presidential candidate won but the other party holds the seat. Earlier this week, the Democratic Congressional Campaign Committee released a preliminary list of targeted districts, and 17 of the 37 districts listed in Table 1 were included. Some of them were districts where the Democrats spent a lot of money in 2016 and would obviously try again in 2018, like CA-49, CO-6, VA-10, and others. But some of the other targets are districts that Democrats haven’t paid much attention to in recent cycles, like CA-39, CA-45, TX-7, TX-32 and — yes — GA-6, where there could be a special election if Price is confirmed as secretary of Health and Human Services. We’re a long way away from knowing which districts will get the most attention in 2018, but if the DCCC’s early list is any indication, the changes in the presidential results are prompting Democrats to consider new places to play offense. And we suspect the National Republican Congressional Committee will be targeting some new turf in 2018, too, spurred on by the shifting politics in many districts across the country.